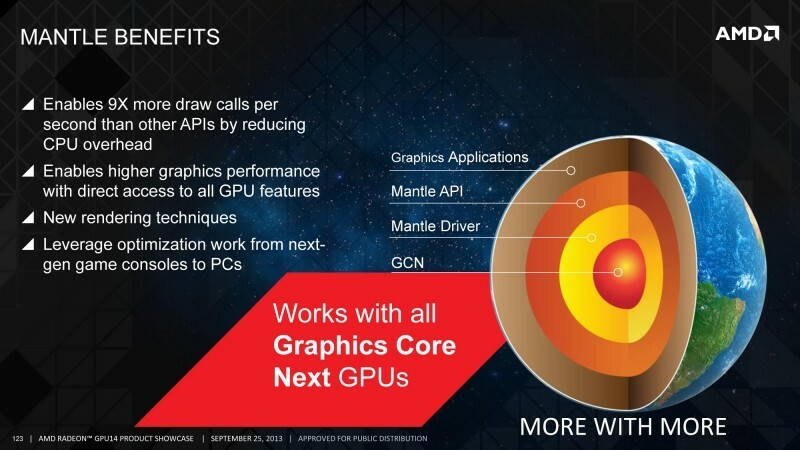 AMD has today announced the next major phase for their low-level Mantle graphics API: a private, beta SDK for developers, which they can use to integrate Mantle into their game engines. While this news doesn't directly involve consumers or popular PC games, having a Mantle SDK available to developers is a significant step. Companies no longer have to partner directly with AMD to get in on the Mantle action, which will help Mantle spread into more and more games (especially indie titles) and a larger number of game engines. AMD has already seen "unprecedented demand" for the Mantle SDK, with 40 different development studios registering for the program prior to its formal announcement today. More developers can jump aboard by visiting the new Mantle SDK portal, which requires you to register your interest with AMD before they select and share access to the information. The choice to release an SDK comes after the team working on Mantle decided that the API has "rapidly achieved all necessary stability, performance and functionality milestones required". This isn't the end of work on Mantle, but it's now ready for a broader audience of developers. You'll already find Mantle support in several game engines, including DICE's Frostbite (Battlefield 4), Crytek's CryEngine (Star Citizen), and Oxide Game's Nitrous; plus several games including Thief, and the upcoming Sniper Elite III and Civilization: Beyond Earth. AMD has hinted that to us that not every Mantle-supporting engine has been revealed thus far, so stay tuned for more announcements in the near future.